In recent years, there has been growing awareness of the need for interprofessional cooperation in healthcare. Countless studies have shown that genuine teamwork and team intelligence are critical to patient safety. Poor communication among health care personnel is a major factor in hospital errors, even more so than the level of staff competence and experience. This is why many schools for health professionals and major health care employers now promote interprofessional education and cooperation. Bedside Manners is a play about workplace relations among physicians, nurses, others who work in health care, and patients--and how their interaction affects the quality of patient care, for better or worse. The accompanying workbook helps educators, managers, patient safety advocates, administrators, and union representatives to analyze and discuss the issues raised in the play. 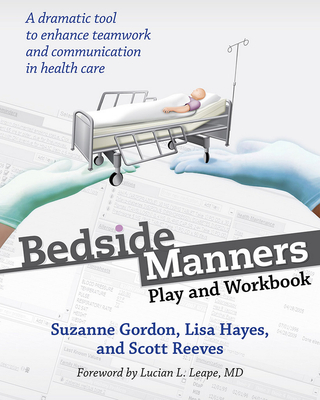 When presented in hospitals, universities, and health care conferences all over the United States, Bedside Manners invariably sparks a vibrant conversation about patient safety problems and how to solve them, job satisfaction and stress, and the importance of information sharing and mutual respect. As text or script, this play is a unique teaching tool for medical and nursing schools, and other health professional schools and continuing education programs involving health care clinicians and staff of all kinds.